Driving across I-70 in southern Utah one can’t help but wonder about the magnificent upturned rocks of the San Rafael Reef. 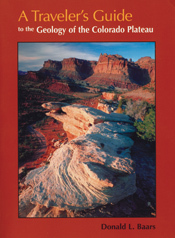 With A Travelers Guide to the Geology of the Colorado Plateau in hand, you’ll soon discover that you were driving through Page and Navajo Sandstone formations, sharply folded into a monocline along one of the "Basin and Range" fault lines. Nearing Flagstaff, Arizona, on Highway 89, you will learn that Mt. Humphry of the San Francisco Peaks, a Navajo Sacred Mountain, was once an active volcano. Keep reading and you’ll find many things worth a slight detour.